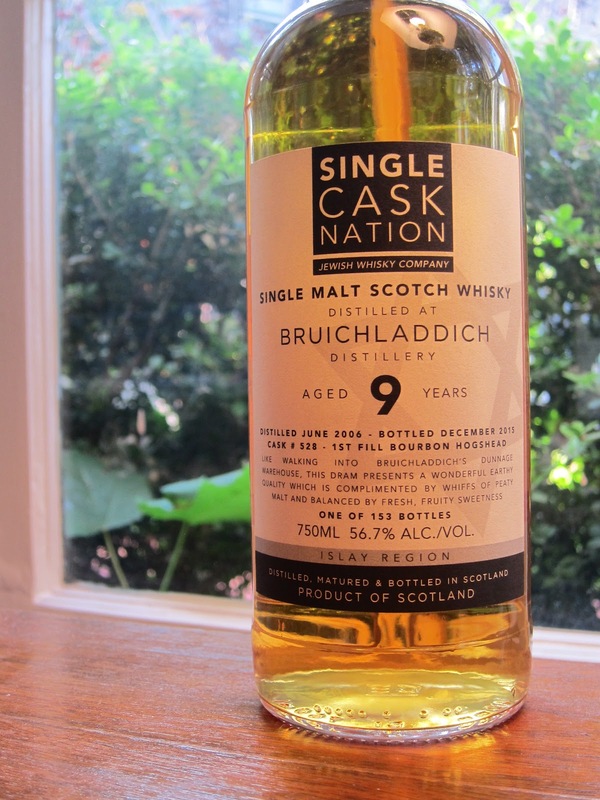 Single Cask Nation Bruichladdich 9yo (56.7%): This week SCN announced two new bottlings, one from Bunnahabhain and the other one from Loch Lomond distillery. Unfortunately I didn't have a chance to taste neither of them yet but I have another expression from their portfolio on my desk instead that I didn't review yet... It is a release from 2016 as well and was sold out literally within hours after its release months ago... 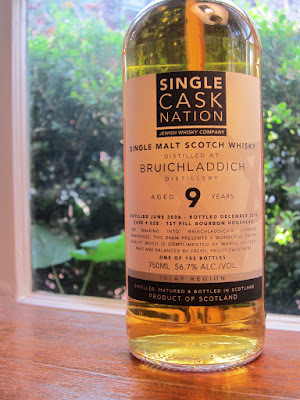 It is a Bruichladdich distilled in June 2006, matured in a first fill bourbon hogshead (#528) and bottled in December 2015. Interestingly the cask yielded only 153 bottles at cask strength. That's quite a lot of angel's share for a nine year old Scotch whisky. Color: Yellow and bright gold. Nose: Green malt and black mold. Peach flavored yoghurt, dry clay and dried strawberries. Surprisingly perfumy, feels like running through Macy's perfume department during holidays... A weird combination of fruits all freshly sliced: Quinces, Bartlett pears, kiwis and papayas. A few drops of water dampened the perfumy aromas a little and added some vegetal and grassy notes. Grilled asparagus, green bell peppers and some toasted wood. Palate: Old wet cardboard boxes, too many of them. Damp basement, decaying newspapers and garden soil. Way less fruity and more earthy than the nose suggested. Some bitterness, more like an aged Marc or Grappa. Nice creamy mouthfeel even at this abv. After adding water I still can taste the Marc, but... Oh, wait a minute: Peat..! Yes, slowly evolving peat with burnt raisin cookies, baked quince, fireplace ash and heavily charred oak staves. Who knew? Now the bitterness on the palate is more identified with tannins, ash and charred oak instead of stems and seeds like I was getting before. Finish: Now, this is kinda odd... It finishes like a small barrel American single malt whiskey: Woody, bitter with tannins and a taste of young new spirit. Overall: Well, definitely not something I was expecting from a whisky distilled and matured in Bruichladdich I guess. 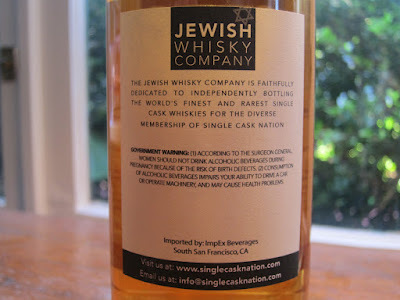 I could put some money on it being an American single malt in a blind tasting. Hard to believe that the cask was a hogshead and not something smaller. Quite an active cask... For the record here I am not that much disappointed (well maybe a little), just surprised but I was hoping a sweeter and fruitier and simply a better palate especially after the nose. Well, things went totally the other direction instead... Another interesting cask from Single Cask Nation but not for me exactly this time.